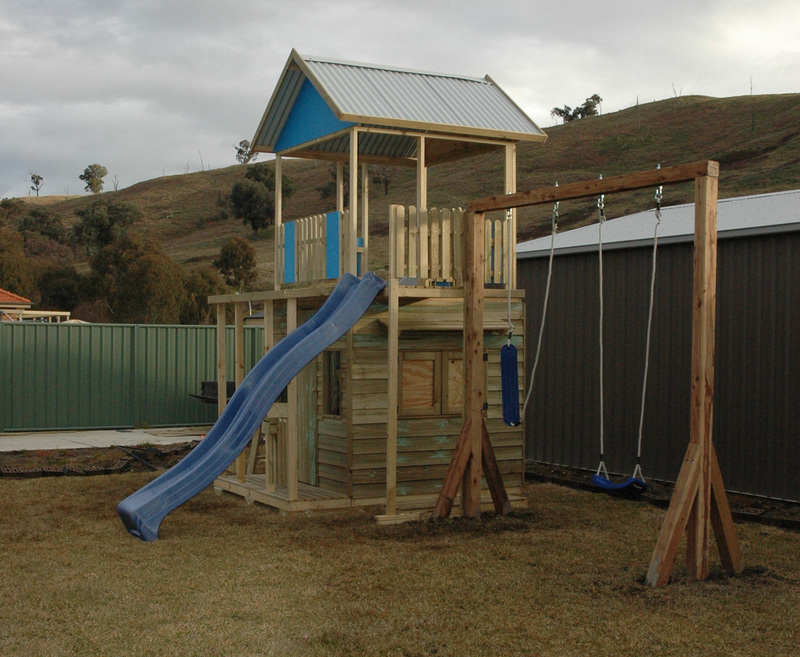 The timber Deluxe Castle Tower is the ultimate single wooden cubby in Kidzone’s range of children’s outdoor play equipment. It is elevated to 1.5m and has a 1.8 X 1.8m top deck.The bottom deck is clad in a child safe ACQ treated pine, it has two front windows, a door, 2 planter boxes and a letter box . There is also a 0.6m veranda attached to the front with picket fences and a treated pine deck. On one side of the lower deck is a Shop Side Servery – complete with two outward opening swinging hinged blackboard doors, magnetic catches, internal serving table, external awning and standing deck.At the other side is a rock wall and ladder to access the top deck and above the Servery wall is a 0.7m side platform with picket fences to access the a 3.1m wave slide. The top deck comes compete with marine ply side panels and gables – your choice from of 3 colours from our range – red, blue, green and yellow – treated pine picket fences and a non-slip rubber mat to cover the deck and keep it from the elements. 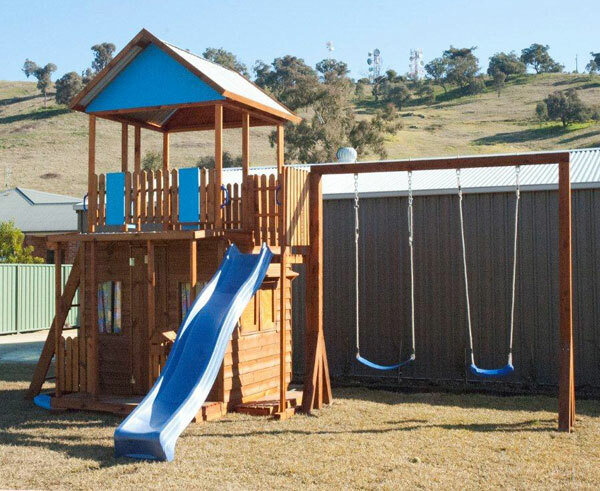 There are also one set of colured handles each above the slide, rock wall and ladder.There is also a corrugated Colorbond roof- your choice of colors from the Colorbond range. Please note our Deluxe Castle Towers, like all o f our timber products, can be upgraded to include many options and variations including those below. 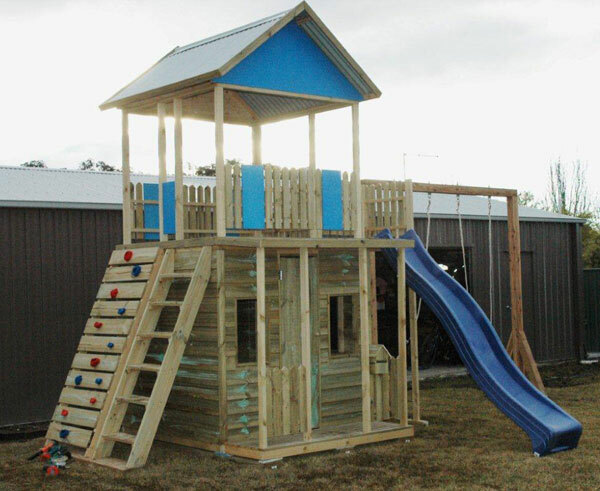 Kidzone Cubbies are located centrally to cost effectively supply our quality timber cubbies to the Eastern States including Sydney, Canberra and Brisbane. If you have any questions about our products or require a free no obligation quote, please contact us on 0425 787 358 or via our contact page. We also offer a special price for installation if you can provide someone to help. Prices are current as at 3rd February 2016.